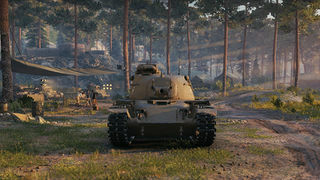 The T95E2 is an American tier 8 premium medium tank. Development began in September 1954, with many components similar to an experimental prototype, the T96. A total of nine prototypes were manufactured, five of which had the 90-mm gun. Four of the vehicles were planned to have the turret of the T96 tank as well as its 105-mm gun. 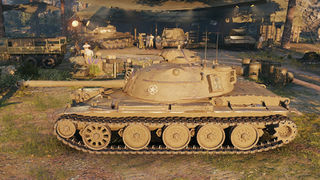 However, because the turrets of the T96 were not ready at that point, two of the new vehicles received turrets from the mass-produced M48A2 tank, equipped with the M41 rifled gun. These prototypes, designated T95E2, were manufactured from May through July 1957. 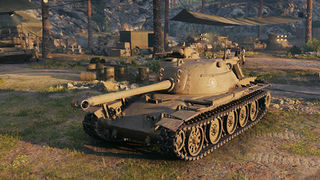 The T95E2 is given out as a reward for the Refer-A-Friend Program. Well rounded turret with a good mantlet. Noticeably better rate of fire and accuracy than Pershing. Massive cupola weakspot on turret, slightly lower view range than Pershing. Premium ammunition is HEAT with 250 pen compared to the Pershing with APCR 268 pen. Below average P/W ratio, and traverse speed for hull and turret. This page was last modified on 19 February 2017, at 22:30. This page has been accessed 85,218 times.